OSU has a long tradition of making great effort to give students their own individual diplomas during the commencement ceremony. For this to work, you must do your part. If one person does not follow instructions, everyone in that college who is behind that person will get the wrong diploma. Please remember there will be little or no opportunity to visit a restroom from the beginning of the lineup process until the ceremony ends. 1. You must report for the procession line up by 9 a.m.
o Undergraduate Candidates please report to your academic college’s lineup location (see above diagram for locations). o Masters and Doctoral Candidates please report to separate lineup locations near the Library Quad Clock Tower and the Valley Library (see above diagram for locations). 3. Signs and maps will be posted throughout the route to help you find the right location. The information tent in the MU Quad can give you directions or answer questions if needed. 4. This is a rain or shine event. If it rains, we will proceed as outlined. Your cap and gown should offer some rain protection. 5. OSU Faculty dressed in regalia serving as Commencement Marshals will begin the line up at 9 a.m. Within each college, honors students will line up first alphabetically, with everyone else lining up alphabetically following them. 6. Marshals will give you a 3-by-5 card containing your name, position number and instructions for the ceremony. Locate the marshal stationed at the sign for your college, under the alphabetical sign that corresponds to your last name. 7. Once you have your 3-by-5 card, line up in numerical order. Please maintain your position so you will receive your own diploma. 8. If you arrive too late to pick up your 3-by-5 card from the marshal, you must line up at the end of your college’s line. Late arriving students will receive blank diploma cases during the ceremony. 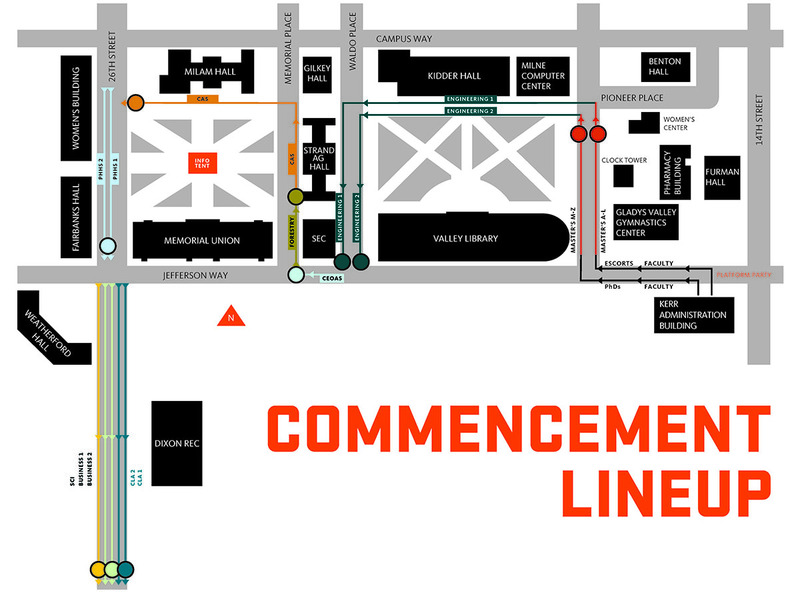 You can pick up your diploma at the Registrar’s office or at the Registrar’s station to the rear of the stage in Reser Stadium after the ceremony. 9. Line up procedures must be completed by 9:50 a.m.
10. At 9:50 a.m. the Marshals will move the lines to the locations where the procession will start. 11. Soon after 10 a.m., the procession will start on Jefferson Street in front of Kerr Administration Building. The sound of pipes and drums will be your indication of the start. 12. The procession will march down the quad diagonally from northeast to southwest. That means the lines for the colleges must be off the path and on the grass to allow the procession to pass between them. 13. All students should face the colors as they lead the procession through the candidate ranks. Men should remove their mortarboards. 14. The procession will include - in order - the chief marshal, the colors, the president’s platform party, faculty, doctoral, master’s and professional candidates. 15. When the procession has passed through the quad, the six columns of bachelor’s candidates will follow. 16. Pay attention at this point to make sure your column does not take off without you. Always follow the person in front of you. 17. The chief marshal will halt the procession outside Dixon Recreation Center for a few minutes to allow for any slack in the bachelor’s lines and to correct any problems. Your column may not have moved very far at this point. 18. Each of the six bachelor’s candidate columns will enter Reser Stadium via the new ramp on the southwest corner of the stadium, near Valley Football Center. The ramp is steep, so watch your step. Candidates needing mobility accommodations should complete the accommodations request survey here. 19. Columns will line up six abreast behind the stage on the field. Once all students are in the stadium, the columns will proceed to the seating area.